The Tool and its supporting content are organized around common lease contents: terms of lease, rent, rights, liability and insurance, subleases, taxes, termination and default, dispute resolution, and other standard contract provisions. Tool users can learn while also building an individualized working lease document—generating lease language to download, email, save for later, and revise along the way. The Tool is designed to educate all parties and support the development of sound lease agreements. Farmers, landowners, and the land all benefit from sound lease agreements. Get started today! 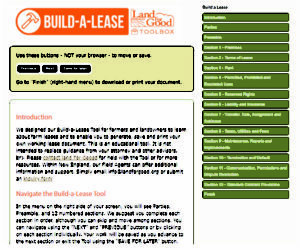 Login at landforgood.org/lease-tool-login. Build-A-Lease outputs are intended for use as a working document to aid in discussions with landowners, farming tenants and advisors. They are not a legal document nor should they replace legal advice from an attorney. This tool was produced with core support by a grant from the USDA/ NIFA Beginning Farmer and Rancher Development Program (NIFA #2015-04544).